Did you ever fancy being a National Trust volunteer but there's no historic properties nearby to love and cherish? Do you have an interest in history and a knowledge of the heritage Wanstead Park in particular? Now is your chance to help out at the historic property on our doorstep! 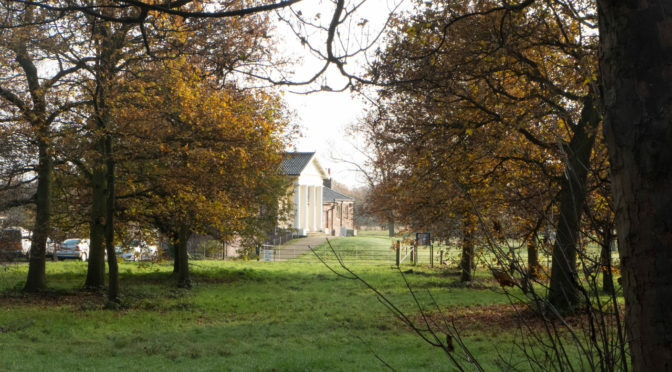 The Temple in Wanstead Park is a Grade 2 listed building dating from the 1760s and is a survival from the heyday of Wanstead Park. It is open to the public every weekend. This gives visitors the opportunity not only to visit this unique and beautiful building but also to learn about the extraordinary history of the Park. Recently there have been difficulties finding enough staff to keep the Temple open at weekends. To help remedy this situation the City of London is looking for people who would like to help out as volunteers at the Temple on an occasional basis. Volunteers would be expected to assist a paid member of staff on those occasions when only one paid member of staff is available. Volunteers will be enrolled as Epping Forest Visitor Centre volunteers to comply with insurance requirements and wear Epping Forest uniform. A half-day mass induction event will be arranged for those who are interested in joining the Temple volunteer rota and training will be given in basic requirements such as fire evacuation procedures, health and safety, and brief history. Epping Forest volunteers are expected to assist with promotion and publicity of the Park and Epping Forest generally. They should be enthusiastic and willing to share this enthusiasm with the public, and prepared to greet visitors and offer them a brief introduction to the Temple and the Park.T hey should be approachable and friendly with a wide range of visitors with differing requirements from children to the elderly and people with special needs, have good verbal communication skills and be able to handle small cash sales. Special interests such as craft skills or experience with children's activities could prove very useful. The Temple is open Saturdays and Sundays October to March 10am-3pm, and April to September 12pm -5pm.